The long, angular boat rocks in the water as Nathaniel Krasnoff climbs in and, along with his teammates, makes sure everything is in order. The boat looks like a sturdy, oddly shaped orange canoe, almost normal except for the wide platform of solar panels spread over the front. It would stand out in any other setting, but here at the Solar Splash competition in Cedar Falls, Iowa, every boat runs on solar power and other student groups rush around making their own final adjustments. Despite a few ongoing electrical problems, the boat seems ready for the qualifying race. 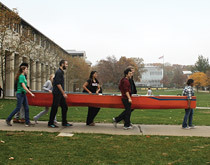 After rebuilding the Carnegie Mellon Solar Splash organization from having no members, no money, and no workspace, Krasnoff is just happy to be here with a boat in good working order. Although the junior engineering major is the president of the organization, that’s not why he gets the first ride. Strangely enough, despite being on a boat-making team, most of his teammates aren’t comfortable in the water. Krasnoff starts the motor, and—for the first time, after months of hull building and propulsion testing—gets to feel how the boat rides, barely worrying about the clock that will determine where they stand in the competition as he circles around the sunny lake. The team doesn’t return to Carnegie Mellon with any prizes, but just having the rejuvenated club attend the competition is a milestone. For Krasnoff, who grew up in San Diego, Calif., being on the water feels like home. As magnificent as these moments are, what he says he really enjoys is putting the skills he learns in his engineering classes to work building the boat. He regularly stays tucked away for hours upon hours in a small concrete room under the university’s football field, figuring out hull shapes, mechanics, electrical issues, or just organizing. Moving forward, the Solar Splash team hopes to do more than just enter a race. They are developing an 18-foot competitive racing boat, thanks in large part to one of 10 $40,000 grants to national programs from Constellation Energy, a supplier of power, natural gas, and energy products and services for more than one million residential customers and 100,000 businesses and institutions throughout the United States and Canada. The CMU team is preparing to travel to the Netherlands in 2014 to compete in the DONG Energy Solar Challenge, one of the premier solar boat races in the world. Already hard at work on what they hope will be a winning entry, Krasnoff and the rest of the team are hunkered down in their workshop, laying epoxy and fiberglass over small models of various hull shapes, having to remind each other to take a break for classes and schoolwork.